The brief was to write a 350 word fashion moment on a particular clothing item, theme, etc in the style of well known fashion journalist Colin McDowell. I chose 'The White Shirt', unfortunately as I saved it as a pdf I had to print screen the image, therefore it's not the highest quality, but hopefully you'll be able to see it (just about). I like how the white shirt always pops up in film with Marilyn Monroe and Uma Thurman, and not forgetting Audrey Hepburn (hence the photograph). We had to set it out as if it were to be put into a magazine, and it had to look like McDowell's fashion moments, so we couldn't go completely mental with it. If I could own the exact outfit Audrey is wearing above, I'd be eternally happy. Instead, as this is not possible I will have to re-create it somehow! I do love this photograph, I intentionally blurred the background to give emphasis to Audrey, so that her and the text stood out, otherwise it was all too in focus. 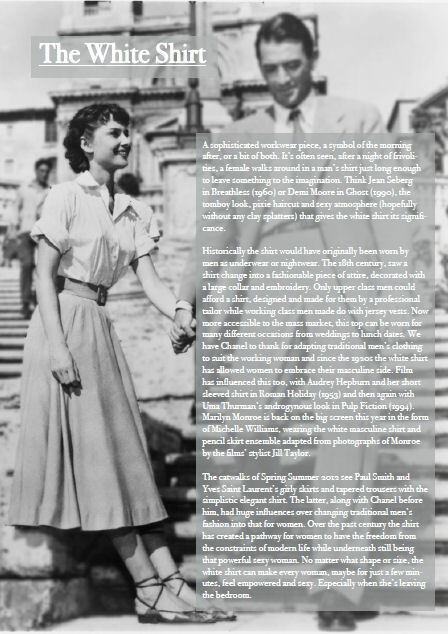 Although I did keep it so you can still see Gregory Peck behind the writing, I wanted Audrey to be centre of attention. We've got the hand in for this assignment on Monday, so hopefully I'll do well. I am happy with how my fashion moment has turned out, I am very much a perfectionist and won't stop until I am completely happy with how something looks, and I'm happy with how its turned out.